So, its official! We're having Mayweather and McGregor boxing each other... Who's your bet? How on earth can McGregor win? It's not like he can grab, stick him a headlock and give him a few knees to the ballix is it? Thing is (as a boxer of four years myself), Mayweather is out of practice. he will be rusty. Also don't underestimate Mcgregor, he has a mean left and I think the videos doing the rounds are being sent out on purpose. He's a canny mofo and wouldn't have taken the fight if he didn't think he had a chance. Conor barely got past diaz the 2nd time, he has always shown he gasses hard by r3-4. I am hoping the for good odds on those lines ! I was at the second Diaz fight. Conor was prioritising keeping his distance so he didn't go down. 2/1 at Bet365 for Floyd to win by decision looks to be a good bet to me , on the understanding that Conor will not want to back down and hopefully his chin agrees. Even as an MMA fan I think the 1/6 on Floyd is a steal , i'm not betting to much so the odds on doesn't appeal too much tho. I do like the intrigue of just how far Conor can push him as long as he doesn't grow frustrated in the early rounds of he can't land leather in the beginning because if he starts chasing the big shot Floyd has his best chance of a KO in rounds 3-6.
Who didn't see it is the question ? I'm not sure, I'm beginning to think that this is a bit more open than it looks. McGregor's only chance is to win it early, before round 5 in my opinion. Floyd is 2 years older and hasn't fought in that time - will he be as sharp as normal? I'm not so sure. If you put a gun to my head, I'd say Floyd wins with a KO as McGregor runs out of steam. Considering Floyd hasn't KO'd anyone for a while and his KO ratio is generally poor, it's very interesting indeed. 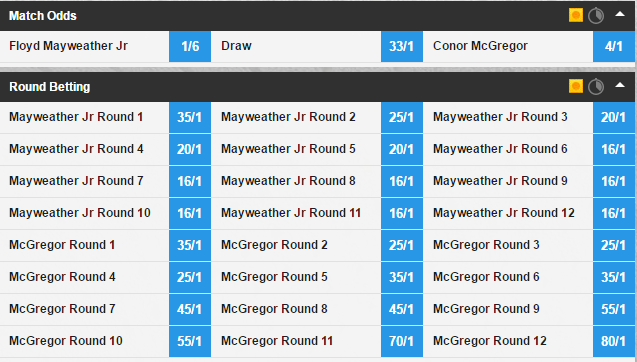 Absolutely lumping on Floyd at 3/10, surely he wont drift anymore? Should be about 1/15 at the most. i think conor wins, somehow........and we will have rematch. that's what the fans want, as a boxing fan tho, this outcome will be pretty disappointing. Got a total of £825 on Mayweather, and had £100 with PP who returned me £120 before they've even weighed in, cheers Paddy. Mayweather may be a little old, but come on! He has done this his entire life, his body still a punching machine, and his defense abilities hasn't gone away. He's untouchable, I don't think he'll let Mc gregor win for rematch and more money, the guy is swimming in money already, he must have a damn money pool at home.